Michaela of Love Letters to Old Hollywood is hosting The Vincente Minnelli Blogathon running from December 16th to 18th. Click HERE to join the celebration of the artistic and versatile director. Raised in the States by her American mother, Jane Broadbent has traveled to London to spend time with her father and his second wife. Jimmy, a banker, and Sheila are titled and run in rarefied circles. Jane's visit coincides with "the season" when young women are launched into society and, at this time, introduced to the monarchy. It had not occurred to Jimmy and Sheila to subject Jane to the rigours of continual parties until Sheila's cousin Mabel made it a sore point. Sheila had missed her coming out due to the commotion caused by Hitler. Jimmy recalls the whole thing as a tiring and terrible bore. Nonetheless, Sheila is off to the races with grand plans for Jane's debut and a ball of their own. Sheila is one of those impetuous women and Jimmy has learned it is best to go along. Jane finds her first ball and the male company provided is not exactly to her taste. Mabel's daughter Clarissa has her eye on a guardsman named David. David also happens to be the name of the drummer who catches Jane's eye. There will be socially awkward, as well as romantic, complications. 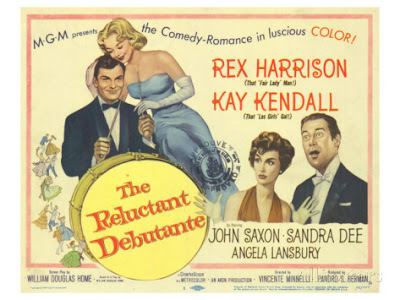 William Douglas-Home's The Reluctant Debutante was written in 1955 and opened in England starring young Anna Massey (daughter of Raymond Massey and Adrianne Allen) as Jane. Sheila was played by Celia Johnson and Wilfred Hyde-White was Jimmy. When the play moved to Broadway in 1956 Adrianne Allen played Sheila. MGM had already bought the rights to the play by the time of the New York run. Home, an aristocratic politician and WW2 veteran knew his subject well when he chose the topic of this play which he adapted for the screen. Vincente Minnelli directs his stars. 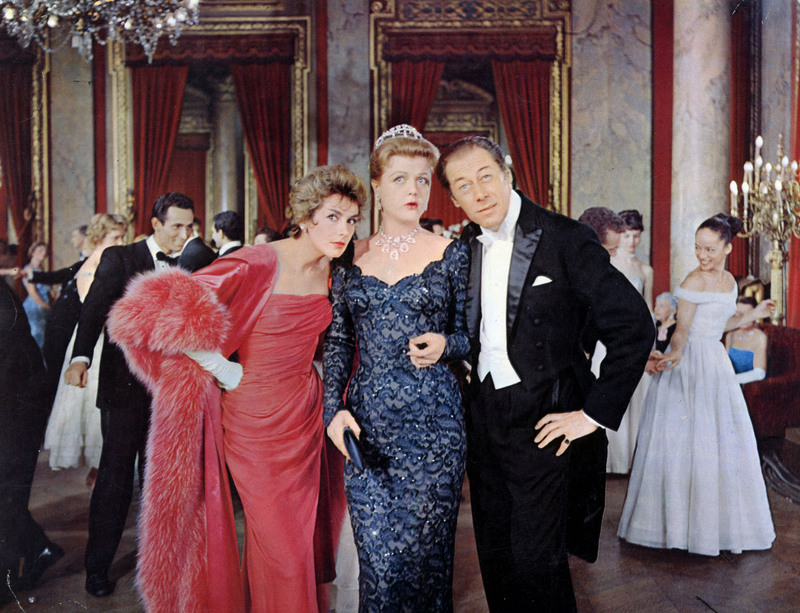 Vincente Minnelli directed the lighter than air comedy-of-manners. 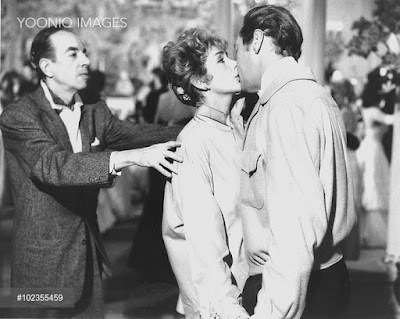 It is one of three Minnelli films released in 1958 falling between Gigi and Some Came Running. 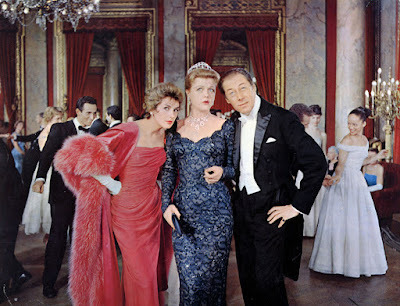 The high society setting cried out for Technicolor, which the artistic Minnelli always used with the master's touch. 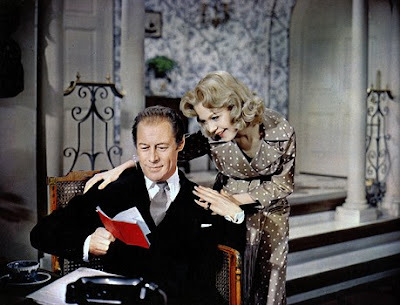 Rex Harrison and Kay Kendall were married from 1957 until her untimely death from leukemia in 1959. On screen in The Reluctant Debutante they are a sheer delight to behold deftly handling the witty lines along with some unexpected and very funny slapstick. Angela Lansbury is Sheila's cousin Mabel, the cause of all this sudden interest in "the season", instigator of gossip and all around meddler. Ms. Lansbury is, as expected, perfection. Sandra Dee is charming as the composed and strong-minded Jane who is, more or less, launching herself into adulthood. John Saxon is her interesting jazzy beau, David Parkson. Peter Myers is very funny as the boring David Fenner, Sheila's choice for Jane and Mabel's choice for Clarissa. Sheila will learn that young men are not always what you assume, especially if both are named David. Jane is out terribly late with the wrong David and Sheila is worried. Sheila: "It's your fault. You were supposed to be watching her." Jimmy: "My fault? It's your fault and you might as well face up to it. You and Mabel Clairmont and the rest behaving like a lot of refined white slave traffickers. Look at you. You dress these wretched children up in silks and satins and throw them on the town to catch the eye of the young men." Sheila: "Don't you want your daughter looking nice?" Jimmy: "Not if it leads to this." Sheila: "This was an accident." Jimmy: "An accident indeed! We sit all summer waiting for a victim like a fellow waiting for a tiger with a goat on a stick. And then when the tiger doesn't come what do you do? Ring up the biggest maneater in London and ask him in for a meal. And then when he carries the goat off into the bush somewhere you say it's an accident. The whole thing is fundamentally immoral." The year of the film's release, 1958, Queen Elizabeth II ended the traditional introduction of young ladies at court as old-fashioned. I may have to watch this one again tonight after reading your lovely post. I'm thrilled that Rex Harrison and Kay Kendall were able to make such a fun film together before she passed. They were both fine comedic actors and this film is a prime example. Thanks for joining the blogathon with this cute comedy! It really is a pleasure watching performers like Rex and Kay and the deft way they deal with the comic situations. Minnelli could handle anything, couldn't he? Oh, this sounds delightful! That dialogue! I saw this once, years ago, but I was very young and I think most of the dialogue went over my head. On one hand it feels terribly dated (a term I despise using), but on the other hand it is true to its setting. Rex and Kay really know how to sell the comedy. They are a delight. What an age we live in! With the snap of a finger you can hear about a film and then watch it. Minnelli would be pleased. Rex would probably expect it as his due. I'll watch anything with Sandra Dee (and have). She projected such a natural innocence. It's a shame her career didn't work better, but she faced a lot of personal challenges from what I've read. It was nice to see one of her earlier films reviewed! Sandra had real charm and appeal. She exhibited such poise despite the problems bedeviled her personal life. Her onscreen presence gives joy to her fans. I too often find I have to be in the right mood to watch Rex. (He probably wouldn't like to know this.) However, this sort of thing is right in his wheelhouse and the vivacious Kay Kendall is his equal in the fun. I havne't heard about this film until now, and your charming review convinced me to look for a copy. I hope you enjoy this look at the society folks and their goings on. Rex and Kay are fabulous. I watched this for the first time this year ( after hearing the title for years ) and loved it! Peter Myers was especially amusing and I thought the set design was marvelous. Reluctante Debutante should be more recognized than it is. Great write-up, CW! Somehow I have always missed watching this but your write-up makes it sound essential and what a cast of pros!! Delightful post! I've never heard of this movie but it looks fun!! I recently started watching Murder, She Wrote and am therefore in an Angela Lansbury mood (unfortunately netflix took it down and I only got to watch the first season). Hopefully I can get a copy of this!! I hear that is a problem with Netflix. Just when you're getting into something, it's gone. Angela is always perfect and naturally she is perfect here.